This is my favorite teapot template from The Cutting Cafe. Print it out--cut it out--decorate it--what could be easier. You can make all kinds of styles. And Yes, you're still seeing purple. Quite different from the previous post. Would that be an eclectic style? 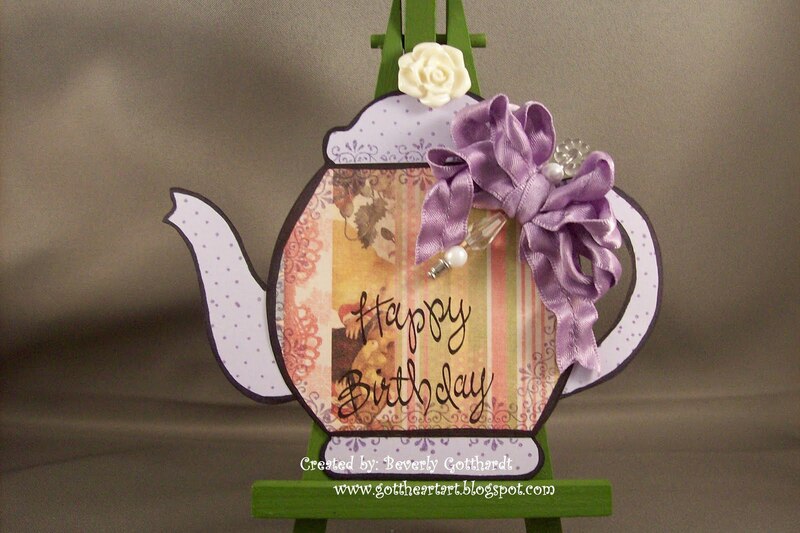 Supplies: Teapot template, Papers: Stampin Up-Lavender Lace, Karen Foster-Easter Stripes, Stamp: Stampin Up-A Greeting For All Reasons, Itty Bitty Backgrounds, CTMH-D1254 Soul Mates, Ink: CTMH-Petal, Black Sharpie Marker, Ranger Archival Ink-Jet Black, Stampin Up-adornments vintage flowers, Spare-Parts-ribbon, Stampin Up-Pretties Kit, ear ring back, flower stick pin-unknown, glue dots. Love the tea pot! Its beautiful! and what a clever card. Thank you for playing along with us @ OCC. I hope that we see more of your work soon! This is really beautiful and what a wonderful shape to work with. Great template! I love the teapot and the bow is gorgeous!!! Thanks for playing along with us this week at Our Creative Corner! What a delightful teapot you have created here, Beverly! Beautiful design and colors and I'm loving that shabby bow. What a sweet birthday card. So happy you joined our tea party this week at Our Creative Corner. Great to see you back with us week after week!